I think it's interesting how some watches were only produced for a single year. It sort of makes you wonder what thought process went into the models that Hamilton kept for multiple years and why some lasted only a short while. 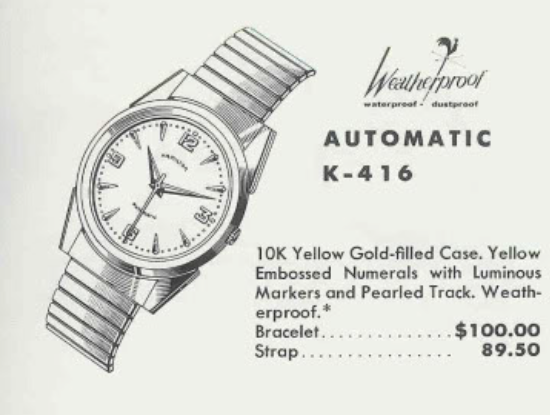 Take for example the 1960 Automatic K-416. It was only available in 1960. The K-416 comes in a 10K gold filled case with bold, prominent, triangular-shaped lugs. The embossed dial is tricked out with golden markers and numerals as well as a gold-colored pearled track. Luminous material is applied to the open dauphine hands and each of the hour markers. Tucked inside the relatively thick case is the 17 jewel Hamilton 661 movement. This work-horse movement is inside most of the K-series automatics. I've been trying to pick up a nice K-416 for a while. Considering they were only made for one year, I've seen several for sale over the past couple of months. I finally snagged one at my usual project watch target price - and that was probably because it was filthy. The case back is gold filled too and screws off. These can sometimes be a bear to open, depending on how long it's been since it was last opened. The 661 movement is in decent shape but can certainly stand to be cleaned. Once everything is cleaned, dried and reassembled with fresh lubricants, the now-running watch can go onto the timer. It's running very well and just a slight tweak to the regulator gets it to level out at a perfect beat rate. Here it is all polished up and I relumed the hands and the dial so that it will glow in the dark. A fresh crystal and new teju-lizard strap completes the overhaul. This is really a sharp looking watch I think - the lugs are pretty bold though - maybe that's why it was a one-year-wonder?